We analyzed several NCAA tournament records – both for a single game and a single tournament – and identified which players in the 2018 field have the best chances of adding their names to the record books. For a single-game record, it only takes one great performance during a 40-minute basketball game, which means even players on double-digit seeds could break a record. However, most of the individual single-season tournament records require a trip to the Final Four, if not a run to the national championship game, for a player to compile the stats necessary to break the record. That means that the list of players who could legitimately break the record are limited to teams who are serious Final Four contenders. There's a good chance this record will never be broken. The most points scored in an NCAA tournament game during even the oldest current college basketball players' lifetimes was Purdue's Glenn Robinson dropping 44 points against Kansas in 1994. Trae Young is one of the college players who could score 40-plus points in an NCAA tournament game and it wouldn't come as a surprise. The nation's leading scorer at 27.4 points per game, Young has had four 40-point games, including 48 points against Oklahoma State in January. With that being said, South Dakota State's Mike Daum also deserves some love. He averages 23.8 points per game and he has had 12 30-point games this season, including two 37-point outings. The 6-9 sharpshooter takes 36.4 percent of his team's shots when he's on the floor – the third-highest percentage in the country – while shooting 42.9 percent from behind the arc and 86 pecent from the free throw line. The Jackrabbits have the lowest turnover percentage in the country (13.8 percent), which means there are more possessions for Daum to bomb away from deep. His name and numbers alone will inspire more than a few 12/5 upset picks over Ohio State in the first round. It would take a six-game average of roughly 30.8 points for someone to break Rice's record, which limits the potential field of players to national title contenders. It would take a 37-point average for a player on a team that gets eliminated in the Final Four and more than 46 points for a player whose team gets bounced in the Elite Eight. So, what player could average 30 points a game and make it to the national championship game? 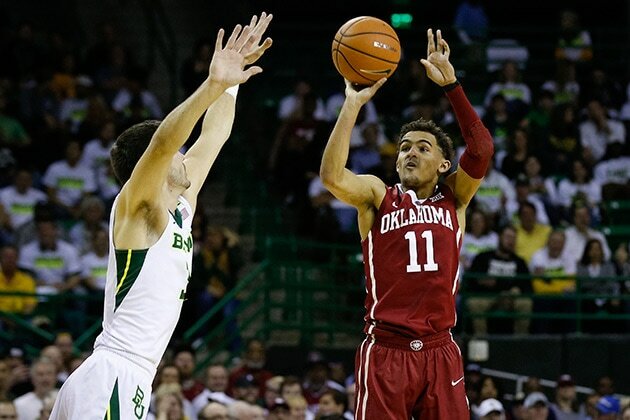 Oklahoma freshman sensation Trae Young is averaging 27.4 points per game – the most in the country and only a few points off of the necessary pace – but the Sooners haven't won back-to-back games, let alone the five consecutive wins it would take to make the title game, since Jan. 13. It seems smarter to focus on a player who could make it to the national championship game rather than a player who's more capable of scoring 30 points a night but who plays for a team that might get eliminated in the first weekend. For that reason, our pick is Duke forward Marvin Bagley III. 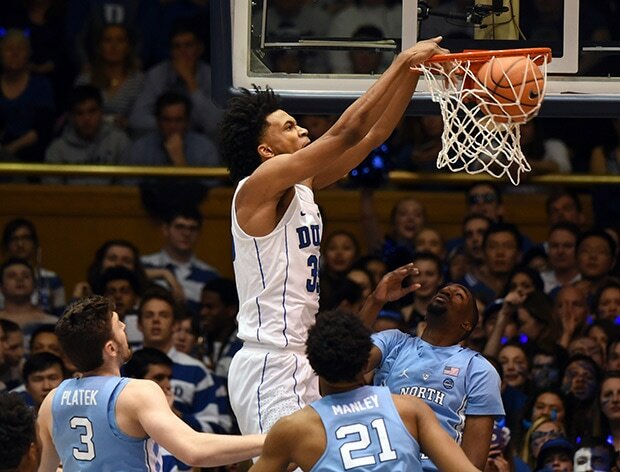 The Blue Devils are on the short list of national championship favorites and Bagley has had two different six-game stretches this season of 148 points and 142 points. Arizona's Deandre Ayton and Villanova's Jalen Brunson are two other players who are capable of multiple 30-point performances while leading their teams to the national championship game. There are few players in the country who you can be confident will attempt 11 3-pointers in a single game, much less make that many. Young is shooting just 25 percent from behind the arc since the start of February (25-for-99), but he made 10 3s in a game against TCU in January and he has attempted as many as 20 3s in a game this season. Yes, Young will be the priority of Rhode Island's scouting report and any opponent after that if the Sooners win their first round matchup, but it takes just one hot-shooting night for the nation's scoring leader to make double-digit 3s in a game. We promise it's not a cop-out to pick these two Jayhawk teammates because both are capable of making 20-plus 3-pointers in a tournament run. Mykhailiuk is 14th in the country in made 3-pointers (106) and Graham is 25th (98). 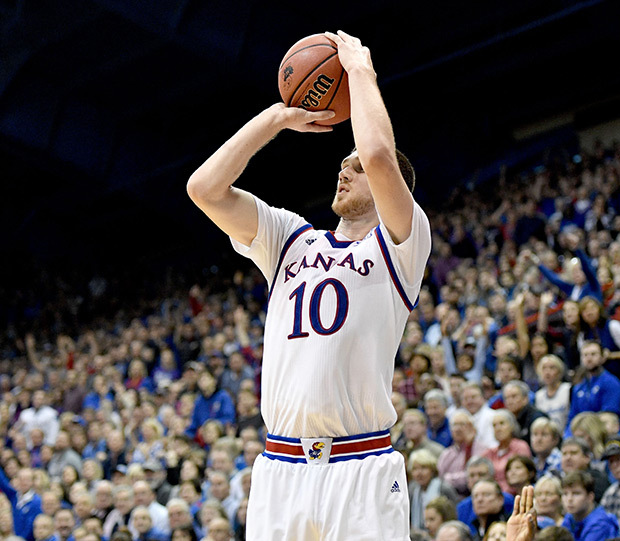 Graham made 27 3-pointers in a six-game stretch from Nov. 28 to Dec. 18 and Mykhailiuk made 25 from Dec. 18 to Jan. 9. In fact, Kansas' four-guard lineups with Graham and Mykhailiuk's fellow backcourt mates Malik Newman (40.9 percent from 3) and Lagerald Vick (36.3 percent from 3) help create more space to operate offensively and prevent help-side defenders from cheating towards any one Jayhawk. Xavier's Trevon Bluiett is also worth noting. He's made 101 3-pointers, including a four-game stretch in early February when he made 20 3s. Bucknell senior forward Zach Thomas leads the country in both free-throw attempts (300) and free throws made (231) this season. He's the Bison's leading scorer at 20.3 points per game and he shoots a respectable 77.3 percent at the line. Thomas draws the fifth-most fouls per 40 minutes (8.0), so while it's a lot to ask of a player to make more than 20 free throws in a game, he's probably the best bet in this year's field. Get this, New Mexico State's Jemerrio Jones is second nationally in rebound average at 13.2 rebounds per game even though he's just 6-5. He's grabbed at least 20 rebounds in five of his last 11 games, including a season-high 23 rebounds against UMKC. Plus, the team's first round matchup could lead to a monster rebounding day for New Mexico State's senior forward. Jones' Aggies could be a popular 12/5 upset pick as New Mexico State faces Clemson in the first round. The Tigers have been without their leading rebounder, 6-8 forward Donte Grantham, since late January and they ranked 10th in the ACC in offensive rebounding percentage, per KenPom.com, so Jones might be able to clean up on the defensive glass. Arizona's supremely talented freshman forward Deandre Ayton is third in the country in total rebounds with 392 and he recently finished a six-game stretch where he accumulated 83 rebounds – the type of nightly excellence on the glass that it would take to break Nick Collison's record. Duke's Marvin Bagley III is another good pick among players in the 2018 NCAA tournament. Both Ayton and Bagley are averaging 11.5 rebounds per game but Bagley hasn't put together a six-game rebounding stretch as prolific as that of Ayton. The key here is finding a strong rebounder whose team plays in the national championship game because breaking the record would almost require six games. Young tied the NCAA assist record in December by dishing out 22 assists in a win against Northwestern State. After all, he is leading the country in that category, averaging 8.8 per game. He has had 11 games this season with double-digit assists. Sure, Young is the nation's assist leader but it would require a run to San Antonio to have a shot at breaking Mark Wade's tournament record. For that reason we're going with Graham, who is the primary ballhandler for a No. 1 seed. Graham is tied for third in the country with 7.5 assists per game. He has had six games with double-digit assists. We could've gone in a couple of different directions with this choice. Who doesn't love seeing West Virginia's Sagaba Konate's volleyball-style blocks at the rim that stop would-be dunks in their tracks? Texas freshman Mo Bamba looks like he was created in a lab with his 7-9 wingspan. But we're going with Marshall's Ajdin Penava, the nation's leader in blocks per game at 4.06 per game. It would take a herculean effort to break Shaq's record – that would require Penava to triple his per-game average for blocks – but Penava has recorded nine blocks in a game three times this season. This was a tough call between Jackson and West Virginia's Sagaba Konate. The two forwards are fifth and third, respectively, in blocks per game nationally. The former actually matched Jeff Withey's 31-blocks-in-six-games mark for the Spartans in December and Michigan State, with a more efficient offense, more efficient defense and six fewer losses than West Virginia, has a higher upside to go farther in the tournament. Carter is fifth nationally in steals per game (2.85 per game) and he is among the best perimeter defenders in the country while leading the point of attack for "Press Virginia." Carter has had as many as nine steals in a game this season and a Final Four run led by strong defense could bring him within striking range of Blaylock's record.